The Raincode COBOL compiler supports IBM Mainframe COBOL syntax, data types, and behavior. Applications can be migrated seamlessly, and the Visual Studio® 2017 plug-in provides a comfortable and productive development environment. The Raincode COBOL Compiler facilitates new development in C# and frees you from the financial burden of COBOL licensing costs. Generates 100% managed code, thread-safe code for .NET and .NET Core. Native support for SQL and CICS®. The source code debugged is exactly the same as the source being maintained rather than the output of a pre-processor. Plugin for Visual Studio® 2017 featuring a debugger, compiler configuration, color coding, code folding, and project management. 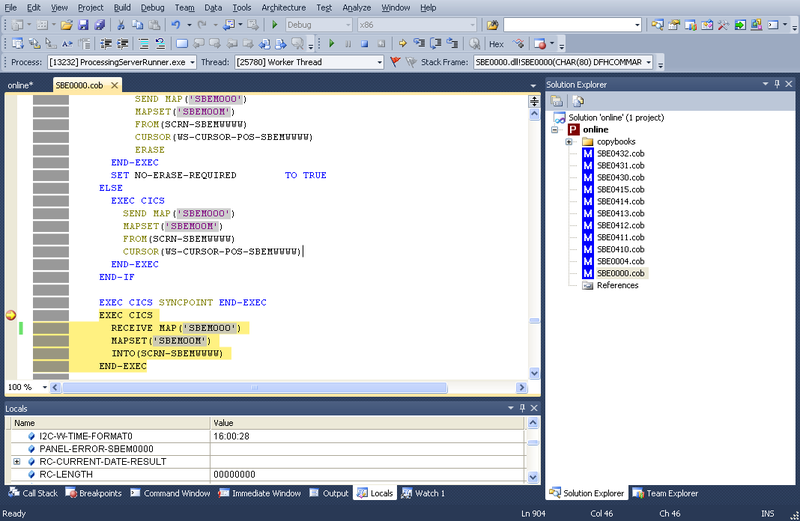 Support for all COBOL data types, with mainframe memory representation. Seamless integration with the Raincode PL/I and Raincode ASM370 compilers. Support for static or dynamic SQL, targeting DB2® (through Microsoft’s HIS®) and SQL Server®. Download the Raincode COBOL Compiler for free and start compiling COBOL on your workstation right now! The Raincode COBOL compiler isn’t a black box. You can fine-tune and adapt our compiler to environment-specific constraints. The Raincode COBOL compiler can intercept, override, or extend events, based on your individual needs. You can alter the behavior of many events including, memory allocations, file I/O, module loading, SQL commands, tracing, and transaction processing through the use of user-defined code. More specifically, by taking advantage of the Raincode COBOL compiler’s built-in CICS recognition ability, you can directly connect to a CICS emulator without using a precompiler. In theory, the DB2 SQL statements included in your COBOL programs should be usable as is on SQL Server. However, the reality is that it’s more complicated than that. Even though SQL is a standard, there are so many discrepancies between SQL dialects that it is common to see portfolios where as many as 60% of the SQL statements require some level of transformation when moving from one database to another. Differences can include built-in functions, operators, implicit type conversion, controlling locking, and the number of records to fetch. Migrating an application from one database to another used to be a migration project in its own right, but not anymore. The Raincode COBOL compiler transforms DB2 SQL statements into equivalent SQL Server statements at compile time, allowing you to run the unmodified code directly on the target database. Compiled programs can target either DB2 or SQL Server based on a runtime flag, and since it all happens at compile time, there is no performance penalty to your system. Statements run as fast as if they had originally been coded for SQL Server.